You're happily engrossed in an old western on TV. All of a sudden, someone climbs into a horse-driven wagon, shakes the reins, and gallops off. The camera hovers briefly on the wagon wheels: the wagon is moving forward but the wheels, inexplicably, are slowly turning backward! You stop thinking about cowboys and the pioneer spirit of the west and start reflecting on science. How can wheels moving forward appear to be turning in the opposite direction? It's all to do with what's called the stroboscopic effect (or strobe effect for short). It's put to good use in everything from photographic flash lamps to police sirens and warning lights for deaf people. Let's take a closer look! Photo: How do flashing lights on patrol cars work? Some rotate. Others are strobe lights that flash on and off electronically. Photo by Leon M. Branchaud courtesy of U.S. Marine Corps. They are high-voltage pieces of equipment so, if you're planning to build your own, you need to exercise appropriate caution. Strobe-lighting effects can trigger a form of epilepsy (known as photo-sensitive epilepsy, PSE, or light-sensitive epilepsy) if the flash frequency is broadly in the range 16–25 flashes per second (some people experience PSE at lower or higher frequencies). Read more about photosensitive epilepsy from Epilepsy Action. Photo: Why do the wheels seem to turn backward when the cart goes forward? It's all to do with stroboscopes! 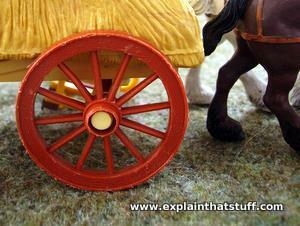 First, let's clear up the mystery of the wagon wheels turning backward. You never see this happening in real life, only in movies—and there's your clue as to what causes it. Movie cameras (the forerunners of modern, video camcorders) make moving pictures by taking roughly 24 still photographs (known as frames) per second. If there are 24 frames being taken each second, each frame lasts one twenty-fourth of a second (1/24s) and there's a short gap between each frame and the next when the camera is not filming. Imagine if the wagon wheel has 24 spokes on it and is also, coincidentally, making one complete rotation each second. Suppose the movie camera snaps a photo. In the 1/24 second it takes until it snaps the next frame, the wagon wheel rotates so that each spoke has turned on exactly 1/24 of a complete rotation. In other words, each spoke is now at the point where the previous spoke was 1/24s ago. All the spokes look identical, so when the camera next takes a photo, it's as though the spokes were all in the same place as they were in the last photo. Although the wheel is rotating, from the camera's point of view it looks motionless! If the wheel is rotating just a fraction slower, every time the camera takes a photo each spoke will have moved on—but not quite enough to catch up with the position occupied by the previous spoke 1/24s ago. And that's why the wheel looks like it's going backward. It's a simple example of the stroboscopic effect: the way in which moving objects appear to be still (or slowed down) when we view them under the right conditions (with a stroboscope or a strobe light). Animation: Suppose this wheel is a rotating cartwheel, with one of the spokes painted red. If you blink fairly quickly, at a constant rate, you'll find you can (with quite a bit of effort), make the red spoke appear to be rotating backwards. That's a simple demonstration of the stroboscopic effect. You can see the wagon-wheel effect in movies, but there's a way to see it in real life too. Make yourself a large disc out of cardboard or hardboard and cut evenly spaced, radial slits into it (ones running from the center toward the circumference). Set the wheel spinning (either with your hand or, better still, with an electric motor), look through the disc at a moving wagon wheel (or anything else) and your eyes will get repeated "snapshots," much like the frames taken by a movie camera. An instrument like this is called a stroboscope and it's very easy to make. It works in the opposite way to a movie camera (turning movement into a series of still images) and also in the opposite way to those weird-sounding, early animation machines you may have heard of: the zoetrope, phenakistoscope, and praxinoscope. 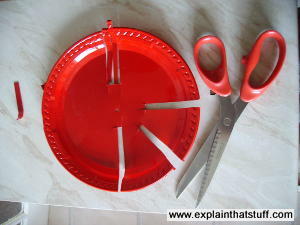 Photo: It's easy to make a stroboscope by cutting thin slits into a plastic or paper plate, which you then spin quickly either by hand or with an electric motor. Using a ruler and a protractor, try making 12 slits (one every 30°), and take time to do them thinner and neater than mine (I'm just quickly demonstrating the idea). You'll find step-by-step instructions in the Make article in the references below. Photo: Strobe lights work in a similar way to the xenon flash lamps used in cameras, but are designed to fire faster and much more often. Cutting slits in great big wheels might be a bit too "19th-century" for your liking. If so, you might prefer another way to achieve stroboscopic effects: using a rapidly flashing lamp called a strobe light. A strobe light works in an exactly equivalent way to a stroboscope. Imagine you're looking at a wagon wheel trundling down your street, only at midnight. It's pitch black so you can't really see the wheel, much less those pesky spinning spokes. 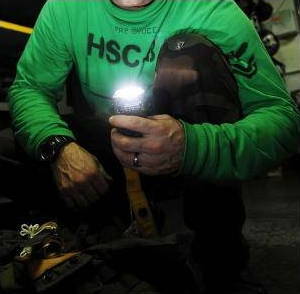 Suppose you flick on your flashlight very briefly then flick it off again. The wagon wheel will light up. Now if you could flick your light on and off 24 times a second, and the wheel was rotating at the same speed as before, the spokes would flicker but appear stationary. How does a strobe light switch on and off at a precise frequency? Sounds good, doesn't it? Unfortunately, switching an ordinary light on and off this quickly is virtually impossible. Ordinary lamps work by a process called incandescence, where electricity flowing through a filament (thin coil of wire) generates heat and light at the same time. Incandescent lamps may appear to come on the minute you flick a switch, but it takes time for the filament to heat up and cool down, so they can't flash rapidly on and off. Fluorescent lamps take even longer to work, so they're no good either. What we need is a lamp that makes a bright, instant flash a bit like a mini bolt of lightning—something like the xenon flash lamp in a camera. Now in a camera, flash lamps often take many seconds to activate, because they're powered (through a capacitor) by low-voltage batteries. With a high-voltage power supply, rapid charging isn't a problem—and xenon lamps like this can be made to flash on and off dozens of times each second. You can also make a strobe flashlight by putting a stroboscope—a rotating disc with slits cut into it—in front of an ordinary incandescent lamp. Another mechanical approach is to use an electric motor and something like a cam (an asymmetrical, eccentric wheel) to interrupt the contacts to a strobe light at a precisely controlled frequency. Artwork: How an electromechanical strobe light works. This unit is designed to measure the speed of rotating machines and it's based on three separate components: a lamp (yellow), a transformer circuit to make the lamp light up (red), and an interrupter unit (blue) to switch the transformer on and off at a certain frequency. The core of the interrupter is a cam (orange) connected to a rotating shaft powered by whatever machine you're measuring. As the cam rotates, it's eccentric wheel periodically pushes apart two electrical contacts (green, labeled 16 and 18), switching off the transformer and lamp, before allowing the contacts to touch again, which switches the lamp back on. That's a simple mechanical way of making a strobe light flash without using any sort of electronic timing circuit. Artwork from US Patent: 1,858,985: Stroboscopic apparatus and method by Peter Davey, Vibroscope, May 17, 1932, courtesy of US Patent and Trademark Office. Since the beginning of the 20th century, most commercial strobe light units have worked electronically, using a variety of different circuit designs to switch something like a xenon or neon lamp on and off so many times a second. I'm not going to go into details here about how timing circuits work, but you can find a few specific examples in the Further Reading section below, in the Patents section. What are strobe lights used for? Photo: Scuba divers use strobe lights to attract attention underwater in emergencies. Photo by Kenneth Abbate courtesy of US Navy. On the serious side, they're widely used in industry to study high-speed machinery. Look at a rapidly rotating engine under a strobe light and you can see its moving parts as though they were completely still (so you have a way to inspect a machine without actually turning it off). If you need a machine or an engine to spin at a precise speed, you can use a strobe light flashing at the same speed to check: when the speed is correct, the strobe light should make it appear motionless. Old-style record players often have little reflective dots around the edge and a small strobe light on the side; if the turntable speed is exactly 33rpm (the correct speed), the dots appear to be stationary when the light is switched on. Strobe lights are also used in medicine, for studying people's vibrating vocal chords. 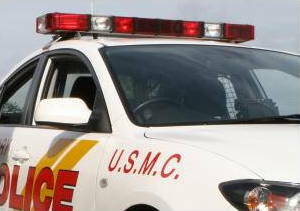 Lights on emergency vehicles (such as squad cars) are sometimes basic rotating lights inside colored plastic, but strobe lights are also used for this purpose because they're brighter and more attention-grabbing. Telephones and doorbells for hearing-impaired people often have an attention-grabbing strobe light on them in place of (or as well as) an audible ringer. Build your own stroboscope by Nicole Catrett and Walter Kitundu. A simple DIY project from MAKE Magazine. PIC Stroboscope by blinkyblinky. How to make your own party strobe, from Instructables.com. A Tweet to Kurt Eichenwald, a Strobe and a Seizure. Now, an Arrest by Cecilia Kang. The New York Times, March 17, 2017. Hostile tweets containing strobe images could amount to criminal acts. Do Fluorescent Lights Trigger Migraines? Tara Parker-Pope. The New York Times, September 2, 2010. Is there any evidence that flickering strip lights can cause headaches? The Man Who Stopped Time and Opened Worlds by William J. Broad. The New York Times, January 18, 2000. Remembering Dr Harold Edgerton, pioneer of flash and strobe photography. Stroboscope stops motion of spinning machinery by Irvin Walters, Popular Science, November 1944. An old but still very interesting article from Pop Sci. Whirling wheels stand still when viewed through homemade stroboscope by Gaylord Johnson, Popular Science, August 1936. Another great, classic article! US Patent: 4,117,395: Digital stroboscope-tachometer by Robert H. Redfield Power Instruments, September 26, 1978. A high-intensity, precision strobe lamp for measuring the speed of rotating machines. US Patent: 2,731,577: Stroboscope lamp by Oscar H. Floyd, Kemlite, January 17, 1956. This goes into some detail about the design of an actual strobe lamp (rather than the timing circuitry). US Patent: 1,909,103: Precision frequency system by Emil H. Greibach, Westinghouse, May 16, 1933. An essentially mechanical stroboscope driven by an electric motor. 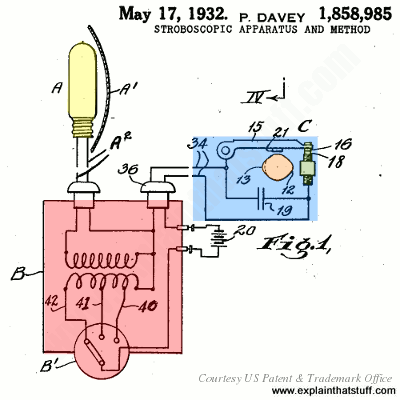 US Patent: 1,858,985: Stroboscopic apparatus and method by Peter Davey, Vibroscope, May 17, 1932. An electro-mechanical stroboscope made from a neon lamp, transformer, and semi-mechanical "interrupter" unit that controls the strobe timing. WARNING! These videos contain flashing, strobe-light effects. Strobe Light Animation by Jennifer Morrow. This neat one-minute video nicely illustrates how a strobe light works. 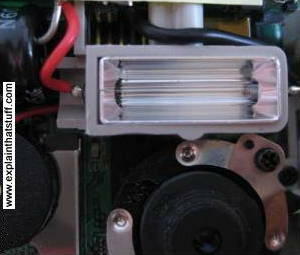 Freezing a fan with stroboscope by OrmuScout. Another neat demonstration of the stroboscopic principle.